The Forbidden City: Beyond Space and Time is a partnership between IBM and the Palace Museum in Beijing, China. For more than five hundred years, the Ming and Qing emperors ruled China from the palaces of the Forbidden City. The art and architectural treasures from this period are the cultural heart of modern China. The principal goal of the project is to provide the means for a worldwide audience to celebrate and explore Chinese culture and history. As an IBM Corporate Citizenship project, the project marries world-class subject matter with world-class technology innovation. It is a premiere showcase of IBM’s leadership in virtual worlds and cultural preservation. The Forbidden City: Beyond Space and Time is the world’s first online virtual world dedicated to a country’s cultural heritage. This is presented as a three-dimensional replica of the square-kilometer palace grounds called The Virtual Forbidden City. The project partners’ goal was to create an experience that is as authentic as possible by being true to important Chinese principles of balance and harmony. Rather than being an isolating virtual experience, the Virtual Forbidden City allows visitors to see and interact with each other and with a wide range of volunteers, staff, and automated characters. To welcome the broadest range of visitors, a simple, easy to use interface guides interactions with the Virtual Forbidden City. As they explore the Virtual Forbidden City, visitors can choose to simply observe the buzz of activity, participate in activities that provide insights into important aspects of the Qing dynasty, or even take guided tours that uncover new insights into the stories of the Forbidden City. In addition, the Virtual Forbidden City also provides an unequalled way for people to plan a visit to the real Palace Museum. Visitors to the Palace Museum will be much better able to find their way and to understand the significance of places and things they encounter because of their experiences in the Virtual Forbidden City. The Virtual Forbidden City provides several tools to aid in your exploration, although your own sense of curiosity will always serve you best. Don’t hesitate to move through the Virtual Forbidden City looking for areas of interest and clicking your mouse to see if more information is available. 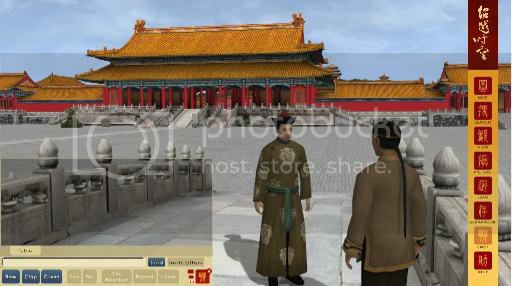 During your visit you will be represented within the Virtual Forbidden City by a figure known as an avatar. Your avatar can take the form of any of several people dressed in Qing era clothing. Registered users can select any of the available avatars and your choice will be saved for future visits. To help you find your way during your visits, maps are available to both show you your current location and a history of your journey, and also to help you find interesting places to explore. You can find majestic halls, animated scenes from Qing life, and even activities that give you an opportunity to learn by interacting with computer controlled characters. Another excellent way to explore is to join your fellow visitors on one of the many guided tours that wind throughout the Virtual Forbidden City. These tours cover a range of interesting topics and lead you to places that help explore important themes about the design and use of the Forbidden City. As you explore, there are many ways to gain a deeper understanding of the things that you encounter. Many of the most impressive artifacts and buildings have additional information and even photos available to provide a deeper understanding of their purpose and construction – when available, the information is only a mouse-click away. To get an even closer look at the intricate details of select items, you can virtually hold a copy of them in your hands. While exploring a place as large as the Virtual Forbidden City, you’re likely to encounter more wonderful things than you can remember. Just as you record memories of any place that you visit, registered users of the Virtual Forbidden City can save photos, places and items that they’ve enjoyed. Once saved, they can be revisited as often as you like and even shared with friends. There’s a thriving online community featuring a photo gallery where, if you choose, your pictures taken within the Virtual Forbidden City will be available for all to see. Visiting the Virtual Forbidden City can be even more enjoyable when you share the experience with friends. You can keep a list of your fellow explorers in your scrapbook and take them on a tour of your favorite sights.